At 08:00 on Tuesday morning New Zealand-time, the first KIWI 40FC Class40 was launched at Pier 21 in Auckland. The brainchild of Lapo Ancillotti and Francesco Piva of BT Boats, the latest Class40 design is the result of a collaboration between Farr Yacht Design and Cookson Boats and the forthcoming sea trials will be closely followed by Class40 sailors. Part of the early design process utilized CFD (Computational Fluid Dynamic) programs in collaboration with the Stevens Institute of Technology. 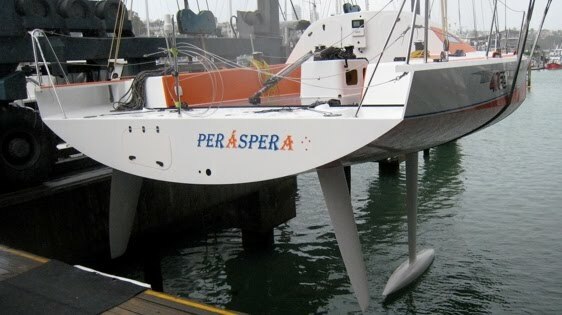 “Developing this design, we utilized many of the research techniques, including CFD, that have been refined for Volvo Ocean Race development,” he continues. 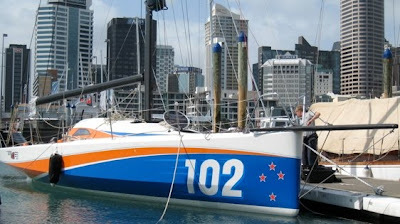 “We have utilized our whole tool set to produce a powerful, low drag hull shape well-suited to offshore sailing.” Through the design evolution process, hull form; chines; transom immersion; longitudinal hull shape; bow-fullness and section style were refined and FYD estimate that they have reduced overall drag by three to five per cent in some conditions.